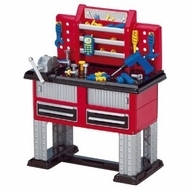 This large and sturdy work bench is perfect for the little builder. It stands 33" high and includes two drawers and storage shelves with sliding cabinet doors. The accessories include a battery operated reversible drill with two drill bits, a hammer, wrench and screwdriver, four nails, six bolts, six nuts, five interlocking gears, five connector brackets, a cell phone and a ruler. The workbench has a peg board and three hooks for hanging tools. Measures 26.25"L x 13.75"W x 33"H.